Silicon for computer chips is grown in large cylinders called “boules” that are 300 mm in diameter and 2 m in length, as shown. The density of silicon is 2.33 g/cm3. 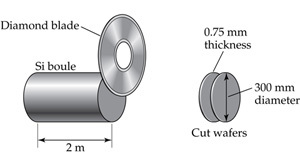 Silicon wafers for making integrated circuits are sliced from a 2.0 m boule and are typically 0.75 mm thick and 300 mm in diameter.